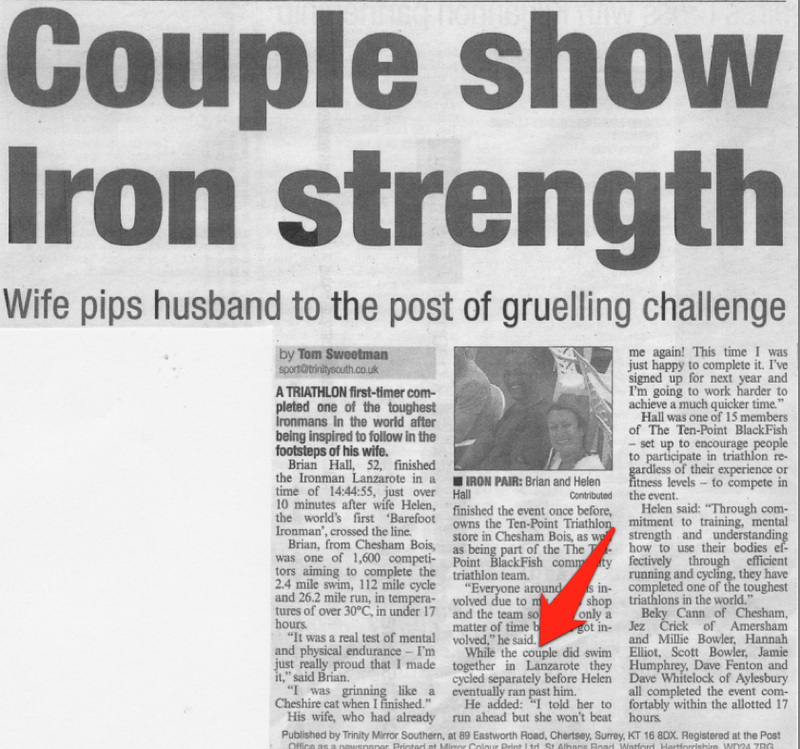 Just goes to show … 3rd Ironman and still so much to learn! Despite the accepted norm of piddle in wetsuit to get warm/convenience; piddle on bike to show circus style co-ordination/mark your drafter; poo where you can and preferably not in a portaloo; puke anywhere (really – see later), I revisited another form of human relief … the fear piss.Standing at the back at the start – as in, right at the back, up against the wall; nobody – nobody – would get the opportunity to come from behind and swim over me and near-drown me again – I was petrified. I was fighting back tears, whilst Big Brian was dancing around next to me, itching to get going. He was the reason I was there, and he was fine!! Go Figure!There it was – a déjà vu moment, remarkably similar to the last day of term in primary school, age 7, when we were allowed to play ‘hangman’ in class. I was at the blackboard with 7 dashes and a few letters filled in. The word was “Alleluja” but I hadn’t spelt it correctly (minor detail) so nobody was guessing it. Consequently, I’d been there for ages. I’d been wiggling around for a while, and suddenly I couldn’t hold it any longer. I heard a non-friend shout out “Miss, Miss, she’s wet herself” and too late, I dashed out to the loos in total humiliation. I remember being sent to the headmaster for The Slipper (showing my age there!) and just being thankful that the summer holidays were about to start, and by the time I went back to school, everybody would have forgotten about it. 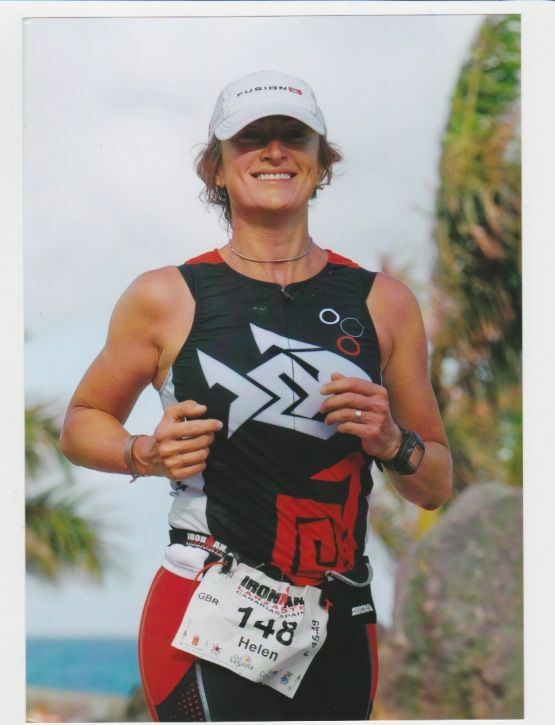 Non-friend hadn’t of course …So, back at the start of my 3rd Ironman, 2nd Lanza effort, and I realized I had a warm, wet feeling trickling down my leg. The klaxon had gone, the field of racers was steadily moving down the beach, towards the shore and into the sea. I moved off my spot and took a backward glance. Sure enough – a tell-tale pool of wet sand marked my anxiety. Another first at ‘self-inflicted-loss-of-dignity’. ‘Going Wide’ is safe … didn’t get knocked about once … but it turns out to add considerable metreage. As if there wasn’t enough to do on Ironman Day, by guiding us away from potential trouble, we ended up swimming not 3.8km, but 4.4km. The clue was in being able to see the outlying canoe the whole time. Doh. If you see another competitor puking in the sea in front of you, and you know you’re swimming against the current, and the current is so strong you feel like you’re swimming against treacle, TURN 90 DEGREES SHARPISH. A vague angle away from said swimmer isn’t enough … and just in case you think that the sea water is healthy and cleansing let me warn you – vomit looks and smells just as we all know and hate, even in salt water. Last lesson in the swim section, and one I didn’t learn until an email received once back home … if you swim with your husband as a loving gesture, elbow him out of the way as you exit the water. Not only will you not feature in any swim exit photos, him crossing the mat ahead of you all smiles and technically beating your swim time does nothing for your morale, and everything for his. So, revive morale by catching said husband on the bike half way up a massive volcano 4 hours later. … and overtake on the run. … and beat husband by 10 minutes overall. Ate much less in the 2 days preceding the race. Did NOT carb-load, in fact I avoided complex carbs, instead opting for simple carbs and light, easily digestible protein. Did not have my usual pre-race vodka night-cap, but watched Mission Impossible and took an Imodium as Mission insurance. Forced 3 scrambled eggs down on race morning, and nothing else other than a big mug of strong black coffee and another Imodium. Drank a half bottle of flat Coke in T1 (70 calories). Taped a pre-frozen double Snickers (400 calories) to the underside of my top tube, and ate both halves at the beginning of the bike (was only going to have one, but decided to scoff both in case it melted and made a horrible mess!). Ate homemade gels … mashed banana, water-soaked chia seeds and honey … yum yum at beginning of ride. After 4 hours, banana didn’t sit well. Will try papaya next time. Saved my porridge pot from my Boots ‘Meal Deal’ at the airport for my Special Needs bag … just thinking about it got me up the big Haria climb (and past my husband). Stopping for a short break just after half-way was very rejuvenating and cold porridge tasted perfect … there’s no logic to this, but I’ll repeat test! Massaged my belly with diaphragmatic breathing whilst laid out in tri position on my gorgeous Cervelo P3 (now called Snickers, after discovering my main race rocket fuel). 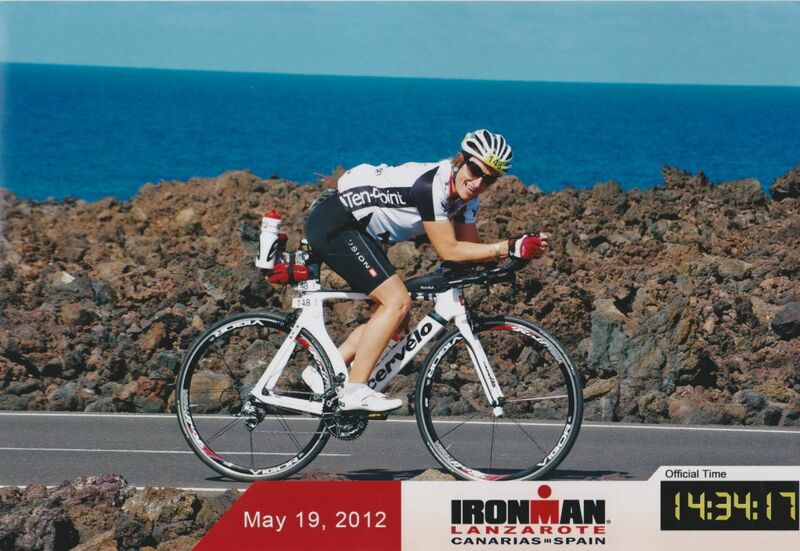 After air-distension and nausea ruined my last 2 Ironman races, the aim was to prevent air build-up in the first place. Small, quiet ‘phuts’ were noticed to exit from the rear. Not exactly wind assistance, but I was encouraged nonetheless. Arrived at T2 requiring the loo (and found a clean one!) but having no nausea. RESULT on both counts. First half of marathon took the same time as when I ran the Berko Half in March (?) … I put it down to no nausea, being warm already (normally takes a good 9 miles or so to feel warmed up sufficiently for strong, fluid running!) and the ground feeling very hot through my even more minimal Fivefinger Seeya’s! So, the upshot of my latest experiment is, overall, positive. 1st Ironman = nausea and sickness (N&S) for 11 hours. 2nd Ironman = N&S 7 hours. 3rd Ironman = N&S 2 hours. Ironman Lanzarote 2012, 14:34:17 hrs.